Many people expected that since we have not seen a 2014 Lexus IS F based on the redesigned 2014 IS sedan, it would not exist for the 2014 model year. Instead, Lexus will continue the IS F for 2014 in nearly the same form as it was offered in 2013, complete with the “old” look, chassis, interior and drivetrain. However, the company has made a handful of changes to allow it to stand out a bit from the 2013 model year IS F but those changes come with an increase in price that is bigger than the increases with the rest of the 2014 IS lineup. The 2014 Lexus IS F carries a starting price of $63,350 not including the $910 destination fee. This base price is up $1,600 compared to the 2013 model year and when you consider the fact that the destination fee has increase from $895 in 2013 to $910 in 2014, the out the door price of the 2014 IS F is $1,615 more than the price for last year’s models. Fortunately, there are some new features for 2014 on the inside and out – although there have been no mechanical changes for the new year. The 2014 Lexus IS F is powered by the same 5.0L V8 as the previous model year with 416 horsepower and 371lb-ft of torque being sent to the rear wheels by means of an 8 speed sport shift automatic transmission featuring steering wheel mounted shift paddles. This sporty luxury sedan will be able to hit 60 in just 4.6 seconds with a quarter mile time of 13 seconds flat and a top speed of 170 miles per hour. New for the 2014 Lexus IS F is a standard carbon fiber rear spoiler and LED fog lights rather than the “normal” light bulbs so the outside has a look that is slightly sportier and a touch more high tech. On the inside, the 2014 IS F wears new headrests with embroidered F logos with soft Alcantara added to the door panels and center console cover. Black full semi-aniline leather trimmed seats have replaced the black Alcantara and leather-trimmed seats while those buyers who order the red leather trimmed seats get black Alcantara inserts with red perforations and black leather headrests. This is an interesting move for Lexus to continue with the “old” IS F considering the vast changes made to the 2014 IS but considering that they do not have a new high performance package ready just yet – it isnt hurting anything to offer the old style IS F with the 416 horsepower engine. Those who want the big power right now can opt for this package rather than hunting around for a new-old stock 2013 IS F while those who would prefer the new look and the lesser output of 306 horsepower in the 2014 IS 350 F Sport. Of course, the 2014 Lexus IS F will also bridge the gap to the next generation IS F that is expected to arrive within the next year or so. 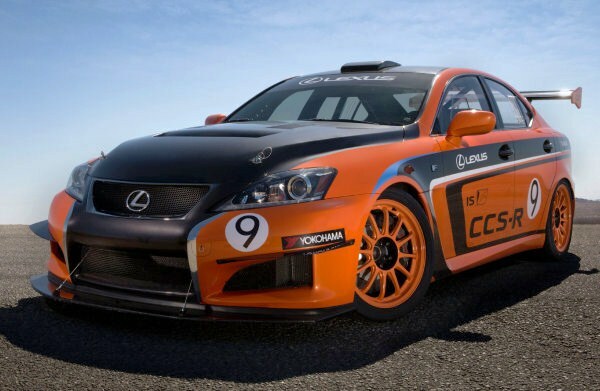 Because no images of the 2014 Lexus IS F have been issued by Toyota yet, Ive used a picture of the awesome 2013 IS F Pikes Peak race car which is based on the 2013 IS F. For comparison’s sake, the image below shows the 2014 IS 350 F Sport from our test session. Click here for a closer look at the head to head comparison between the 2013 and 2013 IS 350.